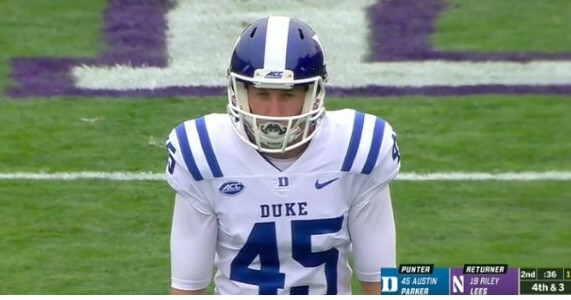 Duke punter Austin Parker knew what he was doing when he came out on the field with a mouth guard that looked like a mustache. He set the table awfully high for every punter in the game. He has a good sense of humor obviously but it feels like a craft beer should’ve come with the mouth guard as well. Or maybe a vest that fits a little too tight. It takes some stones to rock it. As a punter, you need to keep yourself occupied and Parker has found his niche. As long as he doesn’t do anything wrong, he will continue to do whatever he pleases. After Duke’s 21-7 win over Northwestern, heck, it might even be good luck.